The final days before NASA’s New Horizons probe barrels in on its next destination on Jan. 1, 2019, should prove eventful, with scientists trying to sort out whether a distant mini-world detected by the Hubble Space Telescope more than three years ago may actually be a swarm of icy objects. New Horizons’ sharp-eyed camera will serve as a look-out as the spacecraft makes a speedy approach toward 2014 MU69, the official name for the mission’s next target. Scientists will search for moons and icy debris, discoveries which could add intrigue to the one-shot encounter on New Year’s Day 2019. 2014 MU69 is poised to become the most distant object ever visited, and New Horizons’ science team know little about the spacecraft’s next destinations, which lurks in the dark reaches of the Kuiper Belt a billion miles (1.6 billion kilometers) beyond Pluto. The nuclear-powered spacecraft made the first close-up exploration of Pluto and its moons in July 2015, and NASA has approved a new flight plan to fly past 2014 MU69, which scientists say is 100 times smaller than Pluto. But new evidence suggests 2014 MU69, which NASA says will get a new nickname in the coming months, could consist of multiple objects bound together by tenuous gravity. Using precise tracking data from Hubble and an updated star catalog provided by the European Space Agency’s Gaia mission, astronomers found three opportunities last June and July when 2014 MU69 would pass between the Earth and another star. On each occasion, the star’s light was briefly blocked by the object’s passage. Scientists deployed an array of telescopes to Argentina and South Africa in June, but they saw nothing when they expected to see a star temporarily wink out. It turns out the astronomers put the telescopes in the wrong place. Another chance came July 10, when the U.S.-German SOFIA airborne observatory flew to a point where 2014 MU69’s shadow was projected to again blot out a star. Again, astronomers saw nothing. But the New Horizons team hit a jackpot July 17, said Marc Buie, a co-investigator on the mission from SWRI. Astronomers plotted observations from dozens of telescopes, showing exactly when and for how long each telescope saw 2014 MU69 block, or occult, the light from a background star. 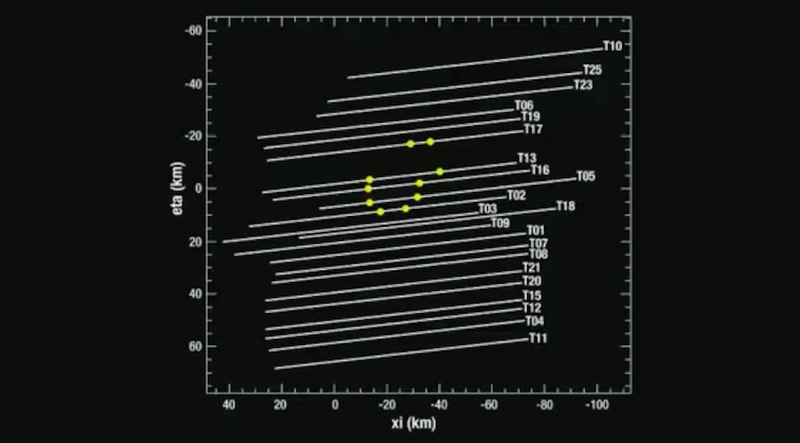 The occultations observed by each telescope varied in time and length, immediately telling Buie and his team that 2014 MU69 was not perfectly round world. The object is probably a dual-lobe world, with its two segments either orbiting one another or a contact binary stuck together “like two globs of ice cream,” Buie said. 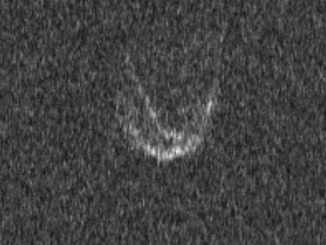 Astronomers took a closer look at data from SOFIA’s attempt July 10 to catch 2014 MU69’s shadow, and the airborne telescope did see a momentary blip in the star the object was predicted to block, but not at the expected time and location. While stressing the results are still preliminary, Buie said his team, which led last year’s occultation observations, believes SOFIA saw a moonlet orbiting 2014 MU69 that has, so far, escaped detection by even the sharpest telescopes, like Hubble. The hypothesized moon also went undetected during the following ground-based campaign July 17. “What we think is we’ve got a contact binary, orbiting around a common center of mass with another moon that sits out there, so now it’s almost like we’ve got three objects in one here,” Buie said. “This might be the harbinger, it might be a hint that there is actually a swarm of satellites around MU69,” Stern said. With less than a year left until New Horizons’ arrival, scientists have limited time to learn more about 2014 MU69. Buie’s team has identified one more occultation opportunity, on Aug. 4, when telescopes could again be deployed to map 2014 MU69’s shape, and perhaps confirm the presence of a moon. 2014 MU69 will blot out the light from a star in a swath extending from South America, across the Atlantic Ocean, into North Africa. Buie said the New Horizons science team is discussing a field campaign with partners in Colombia and Senegal, where a network of mobile telescopes could be placed to try and find the shadow of 2014 MU69 and its potential moon. After that, the next chance for scientists to learn more about 2014 MU69 will come in the final weeks and days before New Horizons speeds by the object. “We won’t resolve the object until the week of the flyby, and it’s going to be a very exciting, almost overnight experience in which MU69 will go from a point of light to a real place in the sky, a new world that humans have explored,” Stern said. The Kuiper Belt is made up of hundreds of thousands of frozen rocks and dwarf planets that orbit the sun beyond Neptune. Pluto is the largest of the group, but scientists think the city-sized 2014 MU69 is more representative of the Kuiper Belt’s population. Objects orbiting in the Kuiper Belt are the leftovers from the solar system’s formation, when dust came together to form protoplanets, and collisions eventually led to the genesis of the planets themselves. 2014 MU69, which appears reddish in Hubble imagery, has likely remained in its primordial state since the solar system’s early history 4.5 billion years ago. Comets that come from the far outer solar system originated in the same frozen, faint environment, but repeated passes near the sun have erased their ancient characteristics. “This object has always been in this very low collisional environment, very cold — basically 40 degrees above absolute zero (minus 387 degrees Fahrenheit) — so it should have preserved a record of that accretionary time better than anything that’s ever been observed by any spacecraft mission in history,” Stern said. Running on a plutonium power source and traveling with enough speed to eventually escape the sun’s gravitational grip, New Horizons is set to make its closest approach to 2014 MU69 at 12:33 a.m. EST (0533 GMT) on Jan. 1, 2019. The flyby will occur late on New Year’s Eve in the other U.S. time zones, when New Horizons will pass by its distant target at a relative velocity of more than 31,000 mph (14 kilometers per second). Ground controllers placed the spacecraft into hibernation mode last month, and an on-board timer is due to wake up the probe June 4 for an instrument checkout ahead of the formal start of the 2014 MU69 encounter phase in mid-August. One of New Horizons’ first jobs will be to locate 2014 MU69 with its on-board camera, a milestone expected in August or September. 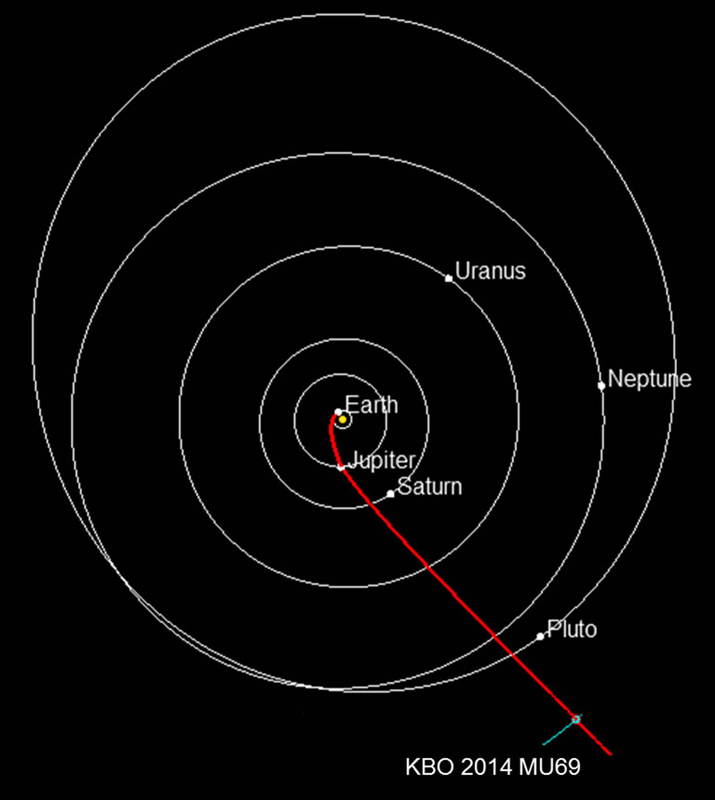 The spacecraft’s navigation team will use the observations to ensure New Horizons is on the right approach trajectory. Mission planners have built in nine opportunities for New Horizons to fine-tune its course with minor thruster firings, beginning in mid-October and extending through Dec. 22, according to Alice Bowman, the mission operations manager at the Johns Hopkins University Applied Physics Laboratory. All of the course corrections may not be required. The best guess for the potential moon’s size is roughly 3 miles (5 kilometers) across, and nearly 200 miles (300 kilometers) could separate 2014 MU69’s main body from its companion, assuming it exists, according to Buie. Officials want to know whether any smaller moons surround the object to ensure New Horizons does not collide with any debris during its high-speed encounter. Scientists have established a preferred flyby trajectory that will take New Horizons around 2,175 miles (3,500 kilometers) from 2014 MU69, but managers could decide as late as mid-December to re-target an aim point more than 6,000 miles (10,000 kilometers) away if they find debris, sacrificing some scientific data and high-resolution imagery for safety. If New Horizons takes the preferred route, the spacecraft will produce sharper images of 2014 MU69 than it did at Pluto, thanks to a flyby distance less than one-third the range of New Horizons’ visit to Pluto. 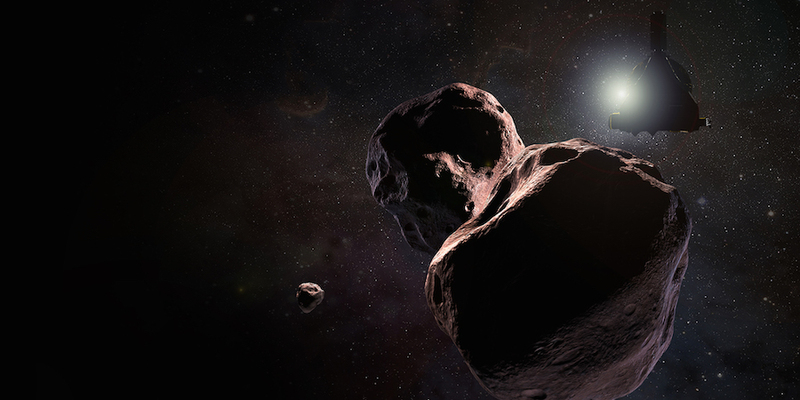 The probe’s other instruments will search for a coma, or gas cloud, surrounding 2014 MU69, and scan the object for water, ammonia, carbon monoxide and methane ices. Scientists also want to know what makes the miniature world so red and dark. It will take nearly two years for New Horizons to beam back all its data on 2014 MU69 back to Earth, transmitting through the vast black gulf of space at a glacial at 1 to 2 kilobits per second. But broad strokes will land sooner, beginning in late December and extending through the first few days of January 2019, when the first high-resolution views will arrive on Earth. One journalist asked scientists if they expect to get a lump of coal for Christmas in 2018. “Maybe two of three lumps of coal,” Spencer joked. Find out more about New Horizon’s encounter with 2014 MU69 at European AstroFest 2018 in London on 9 & 10 February. 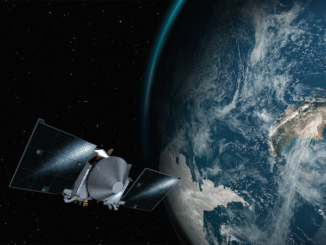 NASA’s OSIRIS-REx spacecraft, en route to asteroid Bennu to retrieve samples and return them to scientists, slingshot past Earth on Friday, using gravity to change its trajectory for a rendezvous with its target late next year. Though not visible to the naked eye or even with binoculars, the green-tailed Comet 45P/Honda-Mrkos-Pajdusakova did not escape the gaze of the world-renowned Arecibo Observatory. NASA’s Hubble Space Telescope has spotted a small, dark moon orbiting Makemake, the second brightest icy dwarf planet — after Pluto — in the Kuiper Belt. The moon, provisionally designated S/2015 (136472) 1 and nicknamed MK 2, is estimated to be 100 miles in diameter. 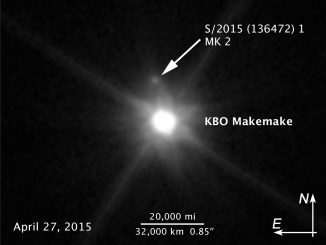 Makemake and its moon are more than 50 times farther away than Earth is from the Sun.